Why is it that weekends seem to zip by far more quickly than week days? One of my favourite ways to make the most of the weekend is with a day trip to the Blue Mountains — and there’s really no excuse not to, with the train journey from Sydney central to the mountains clocking in at just two hours. These day hikes are all within walking distance of Blue Mountains train stations… making them accessible via public transport from Sydney’s CBD. So, if you’re after a day out or a weekend away without the hassle of driving, chuck on your hiking boots, grab your pack, and tap on — you’ll be breathing the fresh mountain air before you know it. Hiking through Leura Forest you’ll spot plenty of mossy trees and ferns, and you might spot Lyrebirds too, before arriving at the cascades. 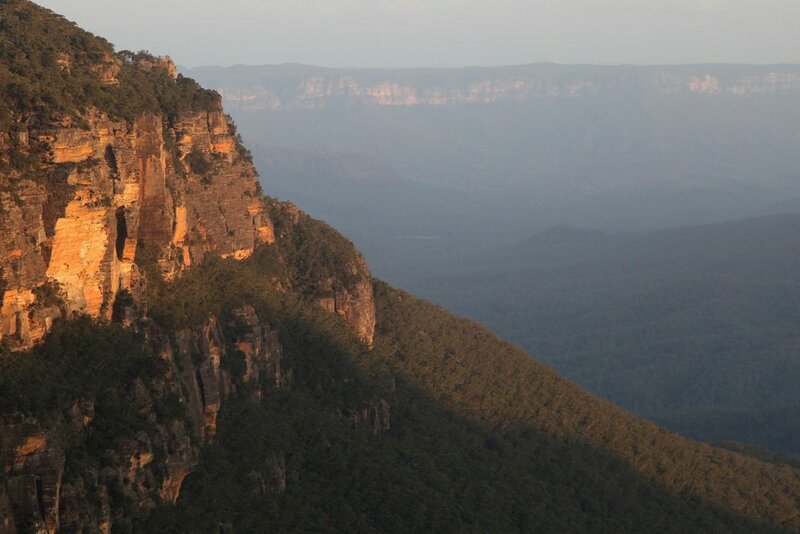 Take in sunset from one of the lookouts at Leura in the Blue Mountains. Get the train from Central to Katoomba. This hike will take you along a bunch of tracks, through the forest and via waterfalls, before ascending to the escarpment for excellent vistas across the valley. You can do it in either direction but I recommend starting at Echo Point in Katoomba and ending in Leura. Starting at Katoomba means you walk down, rather than up, the 800+ steps of the Giant Stairway. The starting point of Echo Point looks out over the Three Sisters in Katoomba and is about 2 and a half kilometres from Katoomba Station, taking just over half an hour to walk. The walk from the station to the start of the hike goes through town so if you want food or drink you’ll have plenty of opportunities to sort yourself out. But, if you’re really itching to get on the track, you can also jump on the bus outside of Katoomba Station and be down at the Echo Point in a matter of minutes. From Echo Point lookout you’ll take the path to the Giant Stairway and make your way down into the valley to join Dardanelles Pass. You’ll walk through Leura Forest, and then begin your ascent via Leura Cascades up to Prince Henry Cliff Walk where you can finish your day taking in sunset at one of the lookouts at the Leura end of the track such as Olympian Rock, Elysian Rock, or Gordon Falls. Each lookout is an about 30 minutes walk from Leura where you can get a train back into the city. Govetts Leap is a spectacular lookout you can walk to in the Blue Mountains. The walk from Blackheath Station, along the Cliff Top Track, through the Grand Canyon loop and back is about 18-20km. Get the train from Central to Blackheath. This Blue Mountains hike is so named because it takes along the cliff top from lookout to lookout. Get the train to Blackheath Station, from there you’ve got an easy 3km walk to Govetts Leap where you’ll start you hike. If you’re after sustenance, there’s plenty of choice in Blackheath (and if an early morning train trip left you craving a great coffee, my tip for coffee at Blackheath is Anonymous Cafe). Just before you arrive at Govetts Leap you’ll pass the Blue Mountains Heritage Centre where you can go to the toilet, pick up maps and get advice, and fill your water bottle. When you get to Govetts Leap you’ll be rewarded with a view that is one of my absolute favourites in the Blu Mountains. This lookout is spectacular at any time of day and in any weather. From there the hike to Evan's Lookout is 3km (so 6km return). This makes for 12km hike all up including the walk to and from the train station. If you want to extend your walk (by another 6km), you can do the Grand Canyon loop which starts right alongside Evan's Lookout. If you’ve got daylight left and your legs are up for it, it’s well worthwhile. Hiking in the Blue Mountains — lunch with a view. A view along the Castle Head track at Katoomba in the Blue Mountains. Get the train from Central to Katoomba. Castle Head track is another great hike from Katoomba. This one starts on Narrow Neck Plateau which you access from Glenraphael Drive. The walk from the station to the start of Glenraphael Drive is just over 3km, and the walk from there out to Castle Head is 4.5km — so all up you’re looking at about 16km return (remember you’re in the mountains… don’t let the whole ‘plateau’ thing mislead you, it ain’t all flat, take plenty of water). This hike might have the best lunch spot of them all, so be sure to pack a picnic. Just past Castle Cliff trig station you’ll find yourself at the end of the track with an unimpeded view across to Mount Solitary. Hike back out the way you came, and if you time it right, you might like to head up Cliff Drive to Cahill’s lookout to catch the sunset over Narrow Neck Plateau and the Megalong Valley and before heading back into Katoomba to get the train home. If you’re anything like me and hot chips is what you crave after a long day hiking, there’s a fish and chip shop on Katoomba Street about 500m from the station. Hanging Rock is an incredible rock formation near Blackheath in the Upper Blue Mountains. Get the train from Central to Blackheath. This is a straightforward hike that starts with a roadside walk, before getting onto a fire trailer/mountain bike track. The view over the Grose Valley at the end of the track is well worth the walk. From Blackheath Station, make your way along the Great Western Highway and then onto Ridgewell Rd, which becomes the Burramoko Ridge trail. 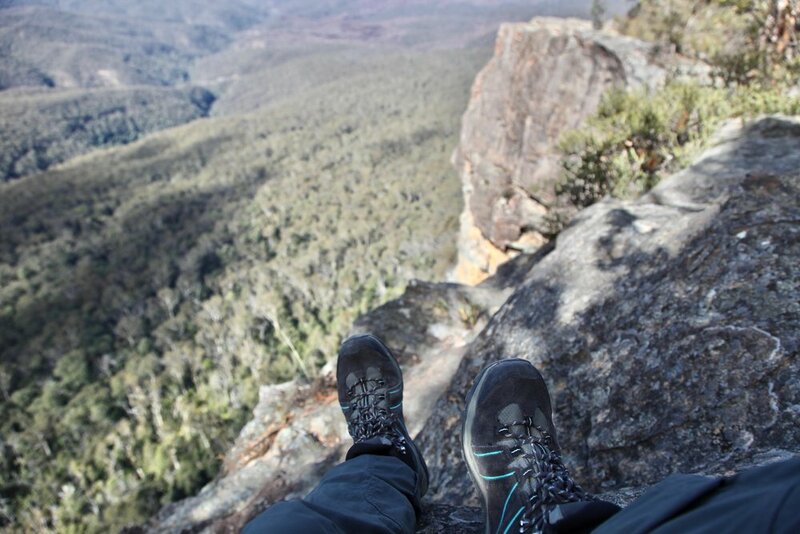 The Burramoko Ridge trail leads you all the way out to Baltzer lookout where you can get a view of Hanging Rock. This walk is 14km return from Blackheath train station, and it’s one that’s definitely all about the destination. The trail itself is enjoyable, but the breathtaking scenery the Blue Mountains is renowned for comes once you reach Baltzer lookout. Be sure to pack plenty of food and water because once you leave Blackheath there’s no facilities until you return at the end of your hike. If you’re after more great spots to spend a day in the Blue Mountains, maybe with a little less hiking, check out the spectacular Blue Mountains lookouts in this list of day trips near Sydney. All of the Blue Mountains lookouts in the mix over there are easy to get to from public transport, meaning all you have to do is pack the picnic and get on the train.